Formerly a Bates college professor, Tom Moser left teaching in 1972 to restore the lost art of fine woodworking by making one-of-a-kind pieces of handmade furniture in an old Grange Hall in New Gloucester, Maine. Mary Moser, Tom’s wife, managed the selling and finances, while their four sons trained as young apprentices. There was no business plan, no product, no sense of marketing, and, to their banker’s horror, no cash or cash flow. The first advertisement, which ran in Down East magazine, read, “Antiques are prized for their qualities of age, design and purity of craftsmanship. Our furniture is inspired by traditional design, constructed with pride and executed by hand, restoring a relationship between man and his practical art.” Since then little has changed in our intent or product. Tom’s early designs bore a strong resemblance to Shaker, Queen Anne, Pennsylvania Dutch and other antique forms. From spiral stairs to a waterwheel, from wooden canteens to a harpsichord, the company’s position was, “if it’s made of wood, we can do it.” In time this search for a proprietary form was synthesized into a coherent and unified body of work spanning many design genres for the home, office and academic environment. What began on pure principle struck a chord, and proved remarkably resilient. Over the course of the years to follow, Tom and Mary’s efforts gained a loyal, growing following. As new designs took shape, and demand grew, the extended Moser family grew apace. 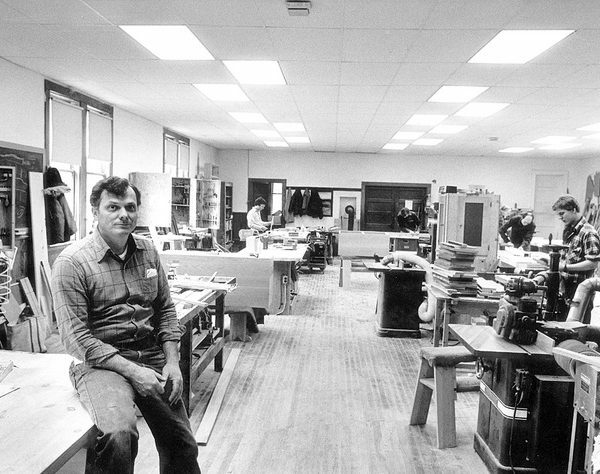 Over time, Tom shared his ethic and aesthetic with skilled craftspeople that joined the Moser team, each welcoming the opportunity to take part in an organization that prioritized excellence – even at the expense of production capacity and profit margins. Today, the Moser family has grown from a one-man operation to comprise a community of nearly 70 skilled craftsmen. Like the wood used to make our furniture, we proudly accept our commitment to the sustainability of our workforce, their families and their communities. Our craftsmen join us to learn, to practice and to pursue perfection. They become integral parts of a living legacy where their own experience is enhanced by techniques learned from their Moser peers, and from countless cultures and movements that span continents, oceans and centuries. The Moser team carries that legacy forward, each and every day, sustaining both new and old tradition for generations to follow. Since 1987, Thos. Moser has called its nationally-recognized Auburn, Maine workshop home. The space has grown to more than 90,000 square feet, and functions like the furniture it produces, with natural workflows that integrate both handwork and beneficial technology. Our six showrooms – located in Freeport (Maine), Boston, New York, Washington D.C., Philadelphia and San Francisco – allow customers to see and experience the results of our work firsthand.